Well people, yes it was another great weekend at the HILTON. Alas i do have a couple of photos that i tried to post, sadly not working for me. That brewery had some truly tasty beers, they make a 10.2% imperial stout that changes flavours as it warms, it starts out coffee and ends up at chocolate. Tarmac, Rochester silo art and last minute shop, tarmac, Avoca Servo, tarmac Dirt Hilton. Met Max and Brian, had a yarn a few beers, a late lunch and took in the ambiance. Laurie rocked up and a few more ales. Yes I did have quite a low flying chair this is said view. It’s so very comfortable until you have to get up. It’s quite a way to get up. Arvo turned to night, Gail turned up and had a few Cab Sav’s, the fire went up a notch and we all drank the night away all but Brian who was fighting a sickness. I can’t even remember things we talked about but we dribbled some **** and poked some fun at each other. Was a slow and steady start, I was 1100km from home with no cup so stubbies of water were required for the first few hours. Max and Laurie showed some some local sights where we met the rocky donkey hill. We made an accord “no track building” mostly because we were all a little under the weather from a few too many Rosé and down turpins Rd to perseverance and back to the Hilton. For a few beers and a hell of a dust devil rocked camp for a good 90 seconds. It caught me off guard my millennial instincts to record everything let me down, I only got a terrible picture of it in the distance. Another night, another fire and we drank the night away a little steadier than the previous.. because I was out of beer and had limited mixer for the wild turkey. I heard Pacs was coming so I hung around to meet another face. We spun a few quick yarns and I had to set off. Thank you so much for having me, OBJ for letting me stay, Laurie and Max for the trails and Brian and Gale for the laughs. Thanks PAC’s for the shirt, it came in handy in the next part of my story. 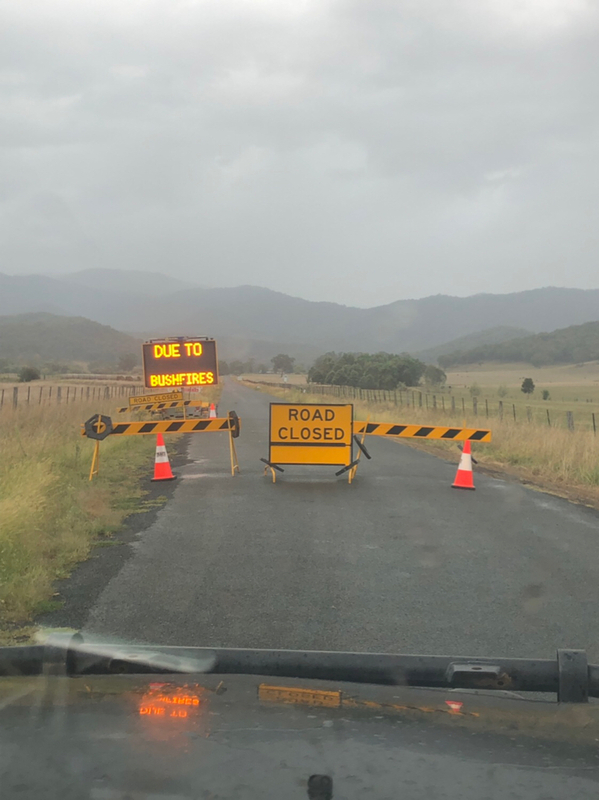 One side up to Cabramurra was closed so up the other to long plain. Long plain hut I had a Pygmy Fire, for my Pygmy camp over (2qt) and my Pygmy chair. Where I got inundated with cloud. Too warm for a jumper but perfect for T-shirt /4wdAdv. Workshirt combo was just perfect. Long boring tarmac home, federal, Hume, m5, peak hour on m7 m2 pennant hills road pacific highway hunter express way. A quick leg stretch at a quaint little park. Awesome trip, I look forward for the next get together. Keep your eyeballs peel, I’m feeling a snowys trip in the next 12 months. Top effort mate, pitty about that screw in the tyre. Hope you did'nt pick it up at AVOCA similar puctures have happened there before? Who knows, it’s part of the game I guess. If anyone ventures around the Hunter shoot me a PM and I’ll try and point you somewhere good or come for a beer.